Come and enjoy a quiet, shady, beachfront holiday park offering unique Rammed Earth and Swiss chalets as well as camping and caravan sites. Slow combustion fire places for your winter warmth, free wood is provided. Only 50m from the beach. 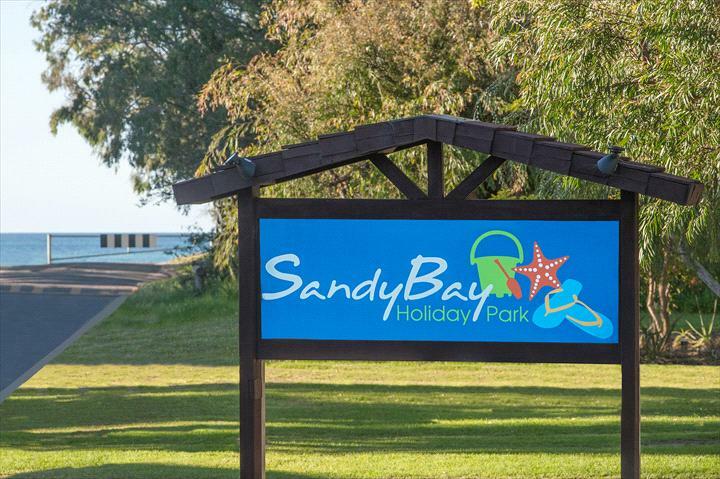 Sandy Bay is a quiet, shady, grassed beachfront park located 6km west of Busselton town centre. It is separated from the beach only by a cycleway which reaches past the town centre, Busselton's famous 2km Jetty and Underwater Observatory. We have 9 Swiss Chalets that sleep up to 4 people and 9 Rammed Earth Chalets that sleep up to 6 people. Prices are based on the first two people staying, any extra people pay $15 per person per night. $200 Bond collected on arrival for chalet bookings. Linen is included in the daily rate. Sorry no caravans larger than 22ft/6.7m long. We are a pet friendly Park but don't allow pets during school holidays. Please always let us know if you are planning on bringing your furry friend. In chalets we also charge a $25 one off pet fee ( to be paid on arrival). Great holiday park, very clean cabin and fully equipped. Fireplace was the best. Also only 5 minutes walk to the beach. Great sunset. Just spent 3 nights at sandy bay caravan park. What a great park. Very well maintained. Nice gardens. A credit to the staff and management. Will definitely return. Rammed earth unit, two bedroom, quaint kitchen,dinning and lounge. Fireplace. Perfect. Turn off the Bussell Highway onto Causeway Road at the first roundabout. Turn left at the first traffic lights onto Albert Street, which becomes the Bussell Highway after the next set of traffic lights. Continue for 6km and you will see the Drive-in Cinema on the left. Take 2nd Road after Drive-in to the right which is Norman Road. We are the last property before the beach on the right. Deposits are not refundable or transferable unless we receive 28 days prior notice of your intention to cancel. Bookings cancelled prior to 28 days notice are subject to a $25.00 cancellation fee. Should the client cancel the accommodation booking the following refunds / charges shall apply: 90 days prior to arrival date: full refund minus 5% of total tariff 45-89 days prior to arrival: full refund minus 10% of total tariff 30-44 days prior to arrival: full refund minus 20% of total tariff Less than 30 days: no refund applicable In all cases the GBTA will retain a $22.00 administration fee and the balance will be forwarded to the Accommodation Property. $200 BOND is collected on arrival for chalet bookings using Visa or Mastercard only. Please contact our office for a copy of the Conditions of Bond.